The Burkinabe Minata Samate-Cessouma was elected as Commissioner for Political Affairs of the African Union at the organisation’s 28th Ordinary Session. Born in 1961 in N’Dorola, in southwestern Burkina Faso, Ms Samate-Cessouma is a graduate of the Ecole Nationale de Magistrature in Ouagadougou and holds a master’s degree in international administration from the Université Paris 1. She began her career in 1994 as a high-ranking official in her country’s Ministry of Foreign Affairs, working as head of the unit responsible for relations with international organisations. In 1997, she joined the Burkina Faso’s embassy in Ethiopia, which is also home to the African Union and the Economic Commission for Africa. 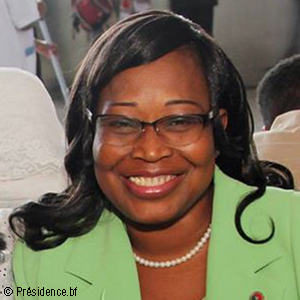 Back in Burkina Faso in 2003, she became diplomatic advisor to the president, before being appointed as deputy minister for regional co-operation in 2007.